Students from across the territory took on the attorney’s mantle this week, citing cases and code to V.I. Superior Court judges at the 24th Annual V.I. 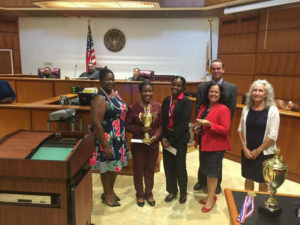 High School Appellate Moot Court Competition and when talking was done, St. Thomas’ Ivanna Eudora Kean High School came out on top. Moot court is essentially a practice court. 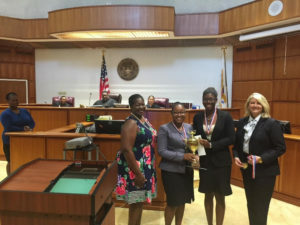 In this week’s competition, the students studied cases, prepare and deliver oral arguments on a current legal issue before a three judge panel. The court runs the program, selects topics, and compiles the relevant statutes and case law in packets for the students. Each team gets help studying the cases and preparing to deliver arguments from two attorneys in the V.I. Bar Association. At stake were scholarship prizes. This year’s legal question was timely, given last year’s hurricanes, which impacted nearly everything in the territory. They took sides in a hypothetical case involving a legal action for declaratory judgment in which the petitioner, whose home was completely destroyed by Hurricane Irmaria, challenged his insurance company’s denial of his insurance claim. 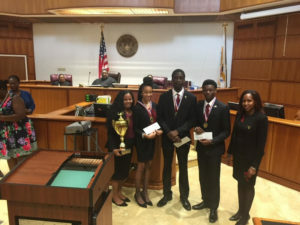 During the first two days of competition, each team presented their arguments to a three judge panel comprised of local attorneys who selected the top two teams from each district. Thursday, the final day of competition, the selected teams presented their arguments before V.I. Supreme Court Justice Maria Cabret and Superior Court judges Harold Willocks and Debra Watlington. comprised of Crystal Fahie and Jade Bryan. The school’s faculty coach was Nancy Thatcher. The school’s attorney coaches were Pamela Colon and Michael Rogers. 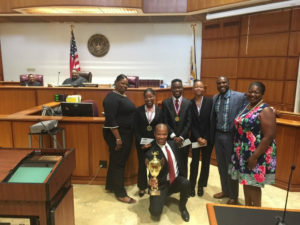 Fourth Place went to the appellant team from the Antilles School comprised of Taylor Robinson, and Sherde Nicholas. The school’s faculty coach was Kim Murtha. The school’s attorney coach was Charlotte Perrell. 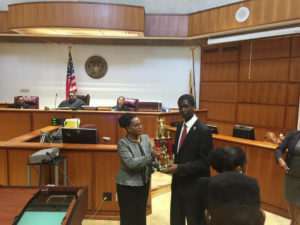 Awards for best orator went to Taylor Robinson of the Antilles school and Jada Romer of the Good Hope Country Day School for the preliminary round, and Jahavheed George of Ivanna Eudora Kean High School for the final round.